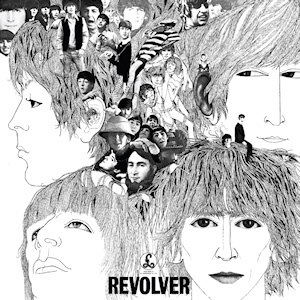 “Taxman” — I have to say, it surprised me to hear the Beatles singing such fiscally conservative lyrics! It’s one of the first overtly political songs in their oeuvre, and while I quite enjoyed their earlier boy-meets-girl stuff, this is a refreshing change. “Eleanor Rigby” — This is a great song, albeit terribly, terribly depressing. Love the violins and other orchestral touches. “I’m Only Sleeping” — I hated this one…something about John Lennon’s whiny vocals just grates on my nerves. I don’t know why he chose that vocal style for this song, but it is super, super annoying. “Love You To” — Sad to say, I couldn’t actually remember this song when I sat down to write this post! A quick refresher online reminded me: this is the one that sounds like Bollywood. First major appearance of the sitar! I like the driving beat of the song, though. “Here, There and Everywhere” — Blehhh. This one’s pretty, I guess, but I found it incredibly boring. “Yellow Submarine” — A Ringo song I actually like! After all, who hasn’t wanted to run away from the world and live a life of ease, sailing the sea of green? “She Said She Said” — I dig this song a lot. It sounds more like modern rock than a lot of their earlier stuff…seems to be looking forward rather than backward. “And Your Bird Can Sing” — I like this one too…I’m intrigued by whatever story it’s telling. “For No One” — This is the other one I couldn’t immediately remember. Don’t have too much to say about it, although I like the prominent piano. “Doctor Robert” — Not a huge fan of this song. I guess songs about drugs just aren’t my bag (see what I did there? ), “Hotel California” being the obvious exception. “I Want to Tell You” — A cool thing about this song is that the verse seems to go on longer than you think it should. I like when musicians think outside the box and thwart listeners’ expectations. “Got to Get You into My Life” — Love this! It’s just a cool, fun rock-‘n’-roll song. “Tomorrow Never Knows” — The sitar really exploded all over this song. It’s not very catchy or melodic, and I found all the different sound effects and percussive cacophony distracting. For the month of August, I’ll be listening to Sgt. Pepper’s Lonely Hearts Club Band, which is widely regarded to be the Beatles’ trippiest album. Should be fun, so stay tuned!